"Be Your Own Kind Of Beautiful". I wish someone told me that as I was growing up. Sure my parents did say I'm beautiful but it was hard to fit in during high school especially when I weight 90kg. Yes, that I think was the heaviest I've ever been in my life. I know that aside from looking different in size, it's even suckier when you can't find clothes or look good in clothes that fit. 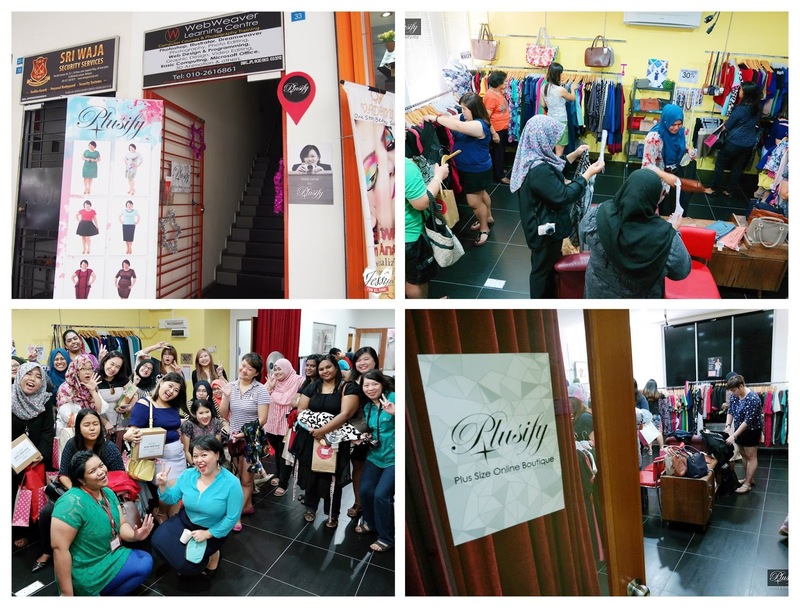 Plusify is a local Malaysian brand that caters to plus size ladies. What I love about their store is that they actually bring in clothing that are modern and stylish. Seriously I tell you, most of the stores that caters to plus size thinks that we're all in our 40s. So imagine my happiness when I see prints and colours that I love. They are located in Kuala Lumpur and yesterday was their Anniversary! Currently they are having an anniversary sale and most of their dresses are from RM49 onwards. I think I must have bought about 4-5 Dresses for RM250. Was in awe when all of the dresses I pick were at 50% discount. Aside from me, a lot of other bloggers got an amazing haul. Some even went home with Acer Tablet which they won from a blogging competition (which I totally forgotten to join. ish, haha). With Cheryn the Owner of Plusify. She is even a blogger and youtuber! Shall do another post soon of my haul from Plusify but for now here is one sneak peak of my haul. Thanks babe! :D Hope to see you on monday? Absolutely...we really have to love ourselves and say I love ME to ourselves every day... before we love others and let others into our lives...as only we know what is best for ourselves.. and love that dress.... very pretty... did you get that??? Hi Jessy, I was there too selecting my clothes. Love the quality and the price also cheap after the discount. Will shop the clothes online now. Oh my gosh, forgotten to mention this but yea, their clothing has one of the best quality I have ever seen from an online boutique. It's like a scuba diving material. Super comfortable. wow you look great! I missed out going as the day busy with son concert day. Looking stunning in that dress babe! Glad you got selected for this event :) saw them selling in pop market at jaya one too! The design of the floral dress look nice and good on you too. You have to wear like this always. Babe, rocking that floral printed dress with sneakers! Nice OOTD! :D Good combination and pairing there hehe. You look nice in that outfit. You look confident with yourself and is a positive way. hey, looking good in those dresses! so glad someone came up with this concept. Now where's the men section? This is surely a good news for people who having trouble finding the right size. The cloths looks fabulous! did you get that last dress? sure looks good on you, and really affordable too. Love the dress you chose. A great place to shop for the bootylicious ladies. Nice seeing you at events. You look good in this!! Good buy! I love their dress.. haha I shoud have buy more that day! Love Cheryn, she is very passionate about all the things she do. I am glad that finally Plusify launch and received a good response from the market. I am proud of her. The pricing are reasonable too. Now every queen can be prettier! Congrats Plusify for enhancing the look on all queens, no matter what size!